The first formal meeting of the group was held in Jeff Burch’s basement in February 1963. Soon they were holding sessions regularly and hosting speakers like Jock Forteith, helmsman on the R-34 airship, which made the first west crossing of the Atlantic in 1919, and F/O Hugh Halliday, RCAF, now a successful author. They realized, however, that their name was too similar to the “Early Birds” group of pre-World War I flyers, and so refashioned themselves the Canadian Aviation Historical Society. 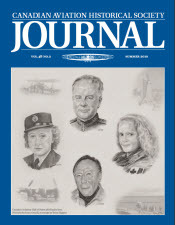 The nascent “Early Bird Enthusiast” journal was also renamed the CAHS Journal. Annual dues were set at $2. By 1963 the first official CAHS convention took place in Ottawa, which by then also had a chapter.